When done, hit OK. 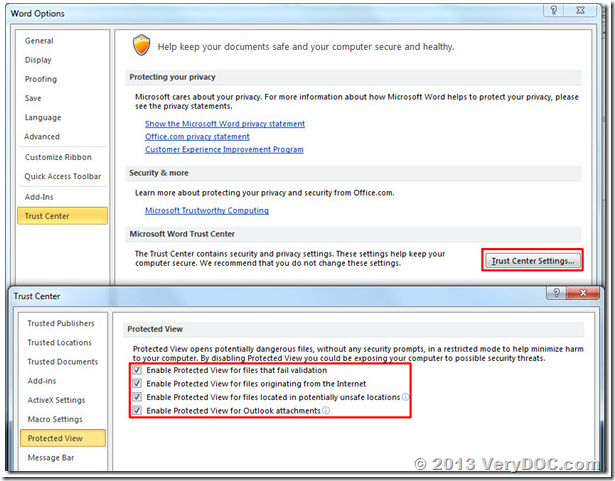 The above example is that of Word 2010, you will have to manually uncheck the options from Excel 2010, PowerPoint 2010, Outlook 2010, etc..
My company was purchased a PDF to Vector SDK Server license from verydoc in June 2011 for Windows server 32 bit. We are now upgrading to 64 bit server and were wanting to know if we can use the existing license. Currently we are passing command line parameters and your License Key to VeryPDF_PDF2Vector() to convert form pdf to Emf. This is working for 32 bit but not for 64 bit. Please can you tell us if this same method will work for Windows 2008 R2 64 bit also. Thanks for your message, the latest version of PDF to Vector SDK is contain a pdf2vector_com.exe file, this is a COM interface, pdf2vector_com.exe COM can be called from both 32bit and 64bit applications. string strCmd = "pdf2vec -$ XXXXXXXXXXXXXXXXXXXX \""
strInFile = strParentDir & "\bin\test.pdf"
strOutFile = strFolderDir & "\_out.emf"
strCmd = "pdf2vec " & strLicenseKey & " """ & strInFile & """ """ & strOutFile & """"
Dim strInFile As String = strFolderDir & "\test.pdf"
Dim strOutFile As String = strFolderDir & "\_test_out.emf"
Dim strCmd As String = "pdf2vec " & strLicenseKey & " """ & strInFile & """ """ & strOutFile & """"
strCmd = "pdf2vec " + strLicenseKey + " \"" + strInPDF + "\" \""
How to append TIFF file to PDF file with standard paper size? 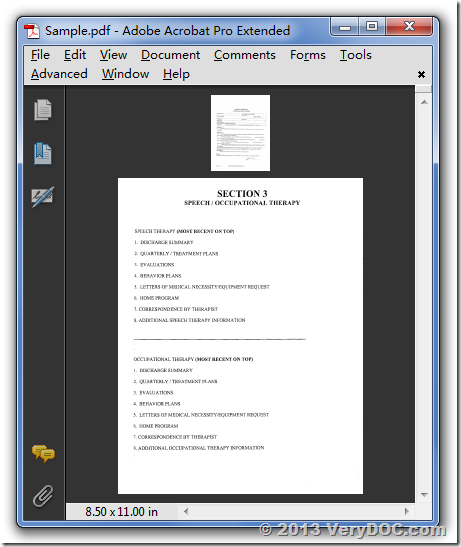 We have a couple of challenges while converting documents to pdf with a command prompt. Looking for your expert assistance to resolve the below issues. 1. When a document is scanned to PDF at 300 dpi or 200 dpi the page dimensions are same with 612 X 792. But when you scan the same document into Tif at 300 dpi the page dimensions are 2500 X 3300 and 1700 X 2200 at 200 dpi. We are trying to append a page(s) of a 300 dpi Tif file to an existing PDF using doc2any.exe in command prompt to convert the tif to pdf. The pages append without any issue but the pdf viewer displays the appended Tif pages larger than the remaining pages of the pdf document. Attached is an example with appended page on page 2 thus making the other pages look smaller on page width view. We are expecting the tif page dimensions to downsize to 612 X 792 while converting to Pdf and retain their original scanned dpi. 2.We have a word document with tables and when we convert it to pdf using doc2any.exe the formatting is lost. Can you suggest or provide a solution to the above if they are already addressed and please let me know if any questions. >>1. We are expecting the tif page dimensions to downsize to 612 X 792 while converting to Pdf and retain their original scanned dpi. 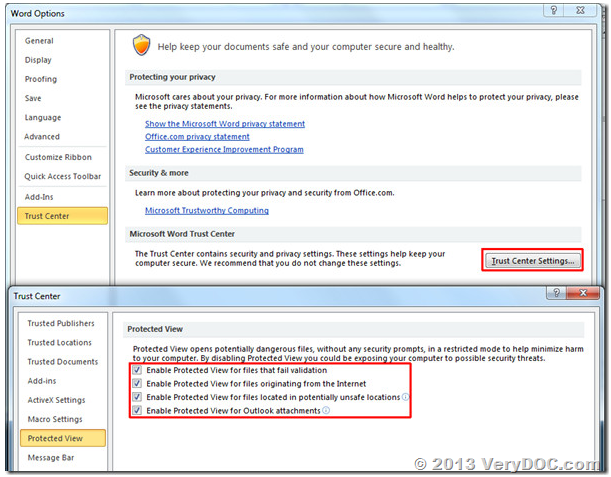 >>2.We have a word document with tables and when we convert it to pdf using doc2any.exe the formatting is lost. 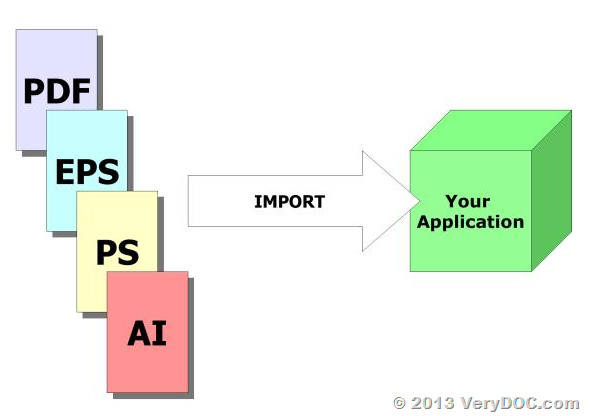 VeryDOC PDF Compressor allows you to compress PDF files, reduce pdf file size easily and quickly. With this handy tool, you can shrink PDF files, reduce the size of PDF files noticeably without any quality loss. The application can process thousands of PDF files at one time. The user interface is intuitive and easy to use, no learning curve, no skill needed. When your PDFs are the best they can be, everyone who uses your files saves time and you save money. For scanned documents, this means advanced image pre-processing, the best available OCR, and the latest image compression. VeryDOC PdfCompressor delivers robust high production 24/7 capability via an intuitive Windows application and a comprehensive command-line interface and API. PdfCompressor can make your documents fully searchable with VeryDOC's super-accurate OCR. Intelligent pre-processing makes our OCR far more accurate and 2-3 times faster than leading OCR products and in up to 117 languages! PdfCompressor combines superaccurate OCR, including support for multidirectional and low contrast text, with the addition of ICR, for handwritten text, and barcodes. Using the latest in image compression technology and the new JBIG2 & JPEG2000 compression formats, PdfCompressor makes the most compact, Web-friendly PDF files available. PdfCompressor will compress typical black and white scans by a factor of 5-10x (compared to TIFF G4) and color scans by a factor of 10-100x (compared to JPEG.) Our unmatched text focused color scan processing ensures maximum data retention, even under high compression. Uniquely, PdfCompressor combines image processing, OCR, advanced compression, PDF/A, Bates-stamping, PDF options settings, web-optimization, batch multithreading and encryption all in one step. strInFile = strFolderDir & "\sample\test-color-image.pdf"
strOutFile = strFolderDir & "\sample\test-color-image_out.pdf"
strCmd = "-ci jpx -cidown -cidownres 150 -gi jpx -gidown -gidownres 150 -mi jbig2 -midown -midownres 150 " & strLicenseKey & " """ & strInFile & """ """ & strOutFile & """"
How to read from Windows Spool file to determine the page size, page count and if it is color / mono? I am developing a software that requires me to read from Windows Spool file to determine the page size, page count and if it is color / mono. The printer can be in any PCL or PS format. Can you advice which is the best license type & cost that i should consider as I will also be installing the software in various location. You can use "Spool File Page Counter SDK" to read paper size, page count, color/mono information from SPL, PCL, Postscript/PS formats easily.